1872 Mining Law Term Papers discuss the modifications of the mining law. When writing a good essay for your history class it should begin something like: Known as the 1872 Mining Law, this law passed in that year was intended to entice would be settlers to the vast open expanse in the western United States. Essentially, as an article in a newspaper points out, “Miners are allowed to recover minerals without paying royalties to the federal government.” All the miner needs to do is prove that once they have “a valuable ore discovery, they can patent (or buy) the surface land for as little as $2.50 an acre.” Through that purchase the mining company is free from government oversight. There have been some modifications and moratoriums placed on certain aspects of the law. For instance the mining process has been placed under the scrutiny of the National Environmental Policy Act. Additionally, the Bureau of Land Management Agency requiring that mining companies post a bond to be used to reclaim the land once the mining activities has ceased. But the law itself remains along with the nagging question that it has outlived its usefulness that eventually lead to the industrial revolution. A well written research paper will note that an article in a magazine the 1872 Mining Law “reflects the priorities of the era it emerged from.” Noting that the law permits the divestiture of publicly owned land to private companies, he points out how the law permits vast permanent changes in the landscape of the areas that are mined, leaving mining waste, contaminating rivers, lakes and streams, not to mention groundwater. There is no longer the need to entice settlers to move to the western states. Modern technology enables miners to extract greater amounts of minerals. The law has in many ways become out of date. The primary issues then seem to become issues of property rights not to mention the extinction of the California Gold Rush. Does the governments role of protecting public land as a sort of trust exist and extend to preventing mining companies from exercising their rights under the 1872 Mining Law? Do the residents and other land and business owners in these areas have the right to protect their rights when violated by poor mining practices? Do miner’s rights to conduct their business in accordance with existing regulations enable them to continue to do business as usual? Claim Staking: Boundaries must be made to establish the limits of the mining area. Posts were put in the ground to mark the outer boarder of the land claimed for mining. The posts were most likely wooden or significantly obvious piles of rocks. Load Claim: A claim over minerals or rock deposits. Public Domain: Federally owned land that has always been owned by the government since they stole it from the Indians. Mining Claim: Having the right to claim the land for mining purposes. Placer Claim: Having to do with mining in water, such as a stream or river. A claim to the minerals found within the body of water. Prior to the mining law of 1872, States held most of the rights to mining law, is open or public mining was considered illegal under federal law. The federal government opposed mining in the West to such an extent that they considered dispatching troops to the West to defer minors and settle land right disputes. 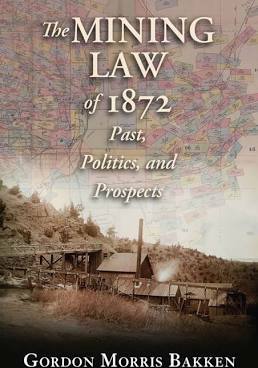 It was obvious that a clear mining law was needed in the United States in order to calm the disputes in the West and the territories west of the Great Plains. Remember at this time in United States history nearly anyone could establish their own government. Even minors organized their own government, typically around mining camps, and gave themselves the right to mind and explore public lands. Prospectors were often seen with guns and ammunition stocks regarding their claims by themselves. The vision of the lawless old West began with mining claims which exacerbated land rights issues. For mill sites, show proper use or occupancy for uses to support a mining operation and be located on non-mineral land. Have clear title to the mining claim (lode or placer) or mill site. Have assessment work and/or maintenance fees current and performed at least $500 worth of improvements (not labor) for each claim (not required for mill sites). Meet the requirements of the Department's regulations for mineral patenting as shown in the Code of Federal Regulations at 43 CFR 3861, 3862, 3863, and 3864. Pay the required processing fees and purchase price for the land applied for. This is according to 30 USC 29 and 43 CFR 3860 and can be read at the Bureau of Land Management website. Paper Masters writes custom research papers on 1872 Mining Law and discuss the modifications to the law.